I do know that I had an image in my head of a certain chocolate quick bread or cake that was in my grandma’s old 1980s copy of the Good Housekeeping Illustrated Cookbook. I have this cookbook in a similar edition, so I flipped to the correct page to find the photo I remembered so well, only to discover that it was actually a recipe for a chocolate date-walnut loaf. Not wanting to heavily modify the cake recipe, I had another thought – there’s a perfectly lovely chocolate loaf cake on smitten kitchen that has always caught my eye, and it would be perfect. 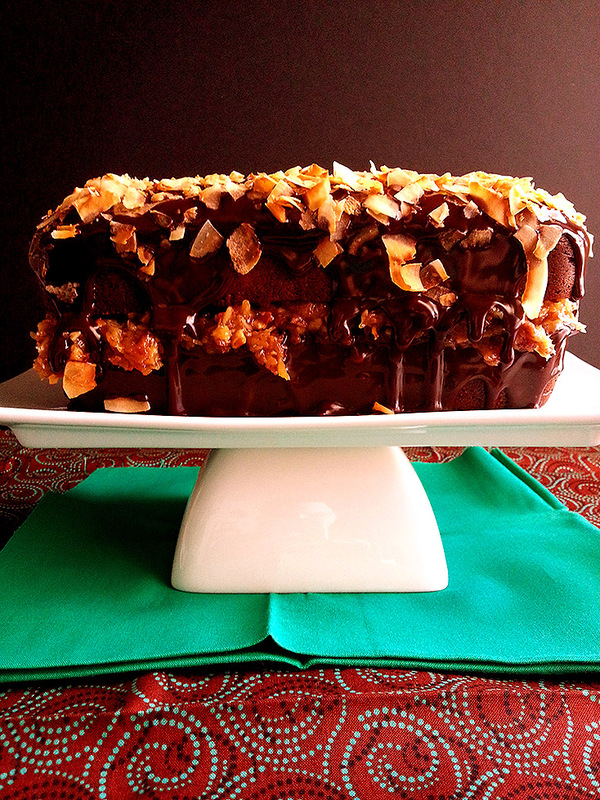 It’s a rich and dense chocolate cake that perfectly sandwiches a caramel-y layer of toasted coconut and pecans. Add a pour of dark melty ganache, and… okay, I don’t know why you’re still reading this, just go make the darn cake already, huh? To make the cake: Preheat your oven to 325 degrees. Grease a 9x5x3 inch loaf pan and line the bottom and long sides with a sling of parchment paper. In a stand mixer with the paddle attachment, beat the butter on medium until smooth. Add the brown sugar and granulated sugar and beat about 3 minutes until the mixture is fluffy. Add the egg and beat well. Add the milk, sour cream and vanilla and mix until creamy and light, making sure to scrape down the bowl. Sift the flour, cocoa, baking soda and salt into the mixer bowl, and mix on low until there are no more streaks of the flour mixture. Scrape down the bowl and mix a bit more. Scoop into the loaf pan and bake for 60-70 minutes. Let the cake cool a bit at room temperature, and then turn it out and wrap it in plastic wrap. Let the cake cool completely at room temperature, several hours or overnight. To make the filling: In a dry skillet, toast the sweetened coconut, stirring often, until it’s a uniform golden brown. Pour into a bowl and toast the pecans in the same way, until they are slightly darker in color and very fragrant; add to the coconut. In a medium pot over medium low heat, whisk the cream, sugar, salt and egg yolks. Cook until bubbly and thickened, stirring frequently. Remove from heat, stir in the softened butter and vanilla, and pour the mixture over the coconut and pecans. Stir to combine, cover with plastic and set in the fridge until fully cooled. To make the ganache: In a medium sized bowl, combine the chocolate and heavy cream. Microwave for 1 minute, and stir. Continue heating for 30 second increments until the ganache is warm. Add the vanilla, and whisk to combine into a smooth mixture. Cover with plastic and let sit at room temperature until ready to assemble the cake. For the coconut garnish, spread the unsweetened coconut evenly on a sheet pan and toast in a 325 degree oven for 6 minutes until golden brown. To assemble the cake: Remove the cooled cake from the plastic wrap and slice in half lengthwise. Place the bottom half on a decorative platter. Heat the ganache until warm and melted, and pour half over the bottom of the cake. Warm the coconut-pecan filling in the microwave until about room temperature, and spread over the ganache layer on the bottom half of the cake. Top with the second half of cake, and pour the remaining ganache over the top so that it runs over the sides. Sprinkle the top with the toasted unsweetened coconut. Let the cake set up in the fridge, then slice and serve! Previous Previous post: mexican pizza = 90s flashback!